Seagrove Beach. in Walton County, FL is a scenic 2-mile beach and residential community in the northwest region of Florida, also known as the “Pandhandle”. Seagrove is an independent neighborhood in Santa Rosa Beach and part of the Fort Walton Beach-Crestview-Destin, Florida Metropolitan Statistical Area just beyond Panama City to the west. Nestled in between three state parks (Grayton Beach State Park, Point Washington State Forest and Deer Lake State Park) Seagrove is best known for its natural beaches, soft white “sugar sand”, and the warm blue green waters of the Gulf of Mexico. 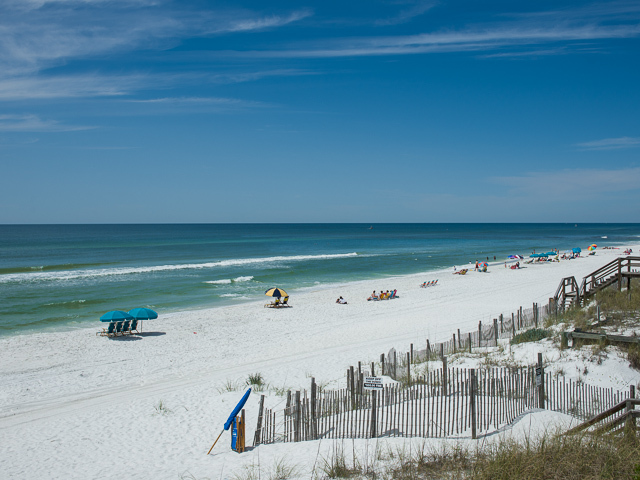 Seagrove is part of the the Emerald Coast region in the Florida Panhandle. The beach is named for its unique grove of oak trees that line the beach – which are a beautiful rarity in a beach environment. The beaches in the rural areas of northwest Florida are unlike any others, with natural groves, rolling dunes, and shorelines largely untouched by developers. The waters of the Gulf of Mexico are clear and serene, providing a tropical feeling. Like much of the rural Florida Panhandle, Seagrove was largely uninhabited for the first half of the 20th Century. It was originally named “Russ’ Hammock”. With the limited infrastructure in the region, Seagrove was only accessible by an unpaved road off of US Hwy 98. Today that road is a paved road called East Coast Highway 30A which has been bringing a growing number of visitors and residents to the seaside community. A growing number of houses, condominiums, and businesses have been constructed in the area. Seagrove bas grown in popularity as a tourism destination and a place to live. The unique landscape of oaks, magnolia trees, tall pines and white beaches has an appeal that few other coastal communities offer. Seagrove is also nearby two lakes – Eastern Lake and Deer Lake – and three state forests. With so many options there is no shortage of outdoor adventures in Seagrove. Canoeing, kayaking, hiking, birdwatching, windsurfing, cycling, boating, fishing, or just taking a picnic and enjoying an outdoor meal are available year round in the sunny, mild climate. While Seagrove has a natural setting ripe for outdoor adventure, it also has a luxurious side. The town has several high-end boutiques, fine restaurants, and luxury houses and hotels. There are a sprinkling of art galleries in the area featuring art and fine crafts by artists passionate about the coastal community. The work of these regional artists make lovely and unique souvenirs or decor for a local residential or vacation home. With quiet small town charm, romantic serenity, endless natural beauty, art and culture, and easy access to panhandle communities to the east and to the west, Seagrove is an idyllic setting for a home or vacation retreat. Homes and condominiums are available for sale for rent in Seagrove. Speak with a local realtor who is familiar with the area and can match your desires with the perfect condo community or house. The community is perfect for families, couples, and retirees looking for a quiet retreat. Also if you’re interested in other rentals, take a look at our 30A rentals.